While on CBS News' "Face the Nation" on Sunday, Sen. Lindsey Graham said he wants the Pentagon to remove U.S. dependents from South Korea. Sen. Lindsey Graham says pre-emptive war is "becoming more likely" with North Korea, especially as that country's weapons technology becomes more advanced. He talked with CBS on Sunday, and one of the bigger headlines out of the interview is that he called for moving U.S. dependents out of South Korea. Dependents are typically family members — civilian spouses and children — who may go with a service member or government employee on an overseas tour. "It's crazy to send spouses and children to South Korea, given the provocation of North Korea," Graham said. North Korea launched a ballistic missile Nov. 28. The country claimed the missile is capable of "striking the whole" U.S. mainland. An expert at the Union of Concerned Scientists believes North Korea's latest missile could travel over 8,000 miles, which would put Washington, D.C., and other major U.S. cities in reach. The expert noted the missile probably couldn't travel that far while carrying a heavy nuclear warhead. The New York Times reports there are more than 28,000 U.S. troops stationed in South Korea. 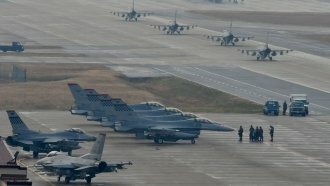 The Pentagon hasn't made any public moves to remove American civilian dependents, nor has the State Department issued any new travel warnings for South Korea.